UPGRADED MATERIAL - Special stickers instead of paint on the basswood make it smoother to write on with better effect and easier to erase. 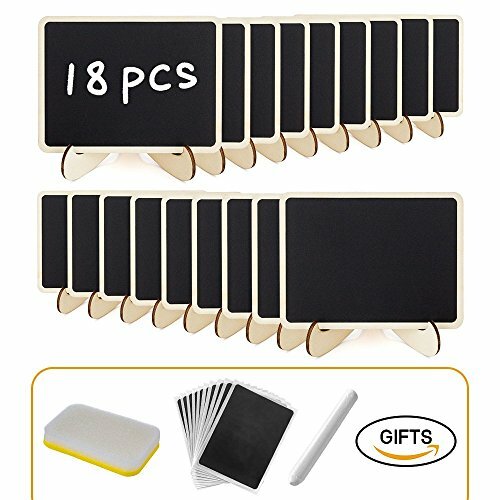 BIGGER SIZE & CUTE DESIGN - 4 x 3 inches mini chalkboards provide more space to write. Stands can be easily set up and disassembled. Safer with round-up edge design. MULTIPLE USE- Ideal for wedding\'s table numbers, kid\'s crafts, gift tags, labeling，decorating or party favors. ENVIRONMENT-FRIENDLY - Chalkboard sign is erasable and reusable for regular and water-based liquid chalk. Extra 10 Pcs labels provided for replacement and labeling. RISK FREE GUARANTEED - If you are not satisfied with our products or have quality problems, please contact us and we guarantee Free Replacement or Full Refund promptly. Like them, but smaller than expected.